David Cameron has dismissed a proposed "emergency brake" on in-work benefits for EU migrants as "not good enough" after talks in Brussels. The plan had been proposed by EU officials to break the deadlock in Mr Cameron's EU renegotiations. He said progress had been made but there was still a "long way to go". The PM is aiming to get a deal with other EU nations on benefits and three other demands at a summit next month before holding an in/out referendum. Mr Cameron wants to prevent migrants from other EU nations from claiming tax credits - income supplements paid to those in low-paid work - for four years, which he says will help reduce high levels of immigration to the UK. But the idea is facing resistance from Central European nations, who view it as discriminatory towards their citizens. EU officials have floated the idea of a temporary ban or "emergency brake", that would be available to all member states, if they can prove their welfare systems are under strain from immigration. Czech officials said this was the "best solution" and could be imposed within three months of the UK applying for it - but Poland has said its citizens cannot be "denied social benefits" in other EU nations. 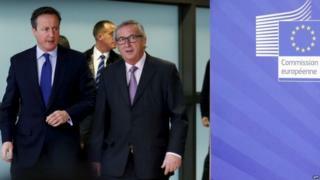 Speaking after talks with European Commission president Jean-Claude Juncker, Mr Cameron said the "emergency brake" plan "needs more work". He insisted he wanted to ensure migrants could not receive benefits until they had paid into the system, adding: "We want to end the idea of something for nothing." But UKIP leader Nigel Farage told the BBC: "The prime minister's position is pretty pathetic and some what anaemic." Mr Farage accused the prime minister of "fiddling around on the edges" and said the issues being negotiated would not make "any difference at all". He compared Mr Cameron to Dickens' character Oliver Twist, saying: "For him now to go to the next European summit and to ask for more, it's a little bit like the boy in Oliver going up and saying 'please sir, can we have some more concessions' - it is pathetic." The idea of the emergency brake has been on and off the table ever since David Cameron started trying to renegotiate the UK's relationship with the EU. Arguably, he wanted an emergency brake on EU migration full stop. He's watered that down to focus on in-work benefits for up to four years. The current idea would be that Britain could initiate a request for this emergency brake for up to four years if it could prove Britain's social and welfare system is under excessive strain from immigration. But that brake would have to be approved by the majority of other EU member states - and of course, right from the beginning, they have been opposed to suspending benefits for other EU migrants. One of the founding principles of the EU is the freedom for every EU citizen to live and work as equals anywhere in any EU member state, so they don't like it. At the end of the day, these other countries want Britain to stay in the EU. It could be that they just hold their nose and say yes to the deal, or it could be there's a lot of European fireworks ahead. 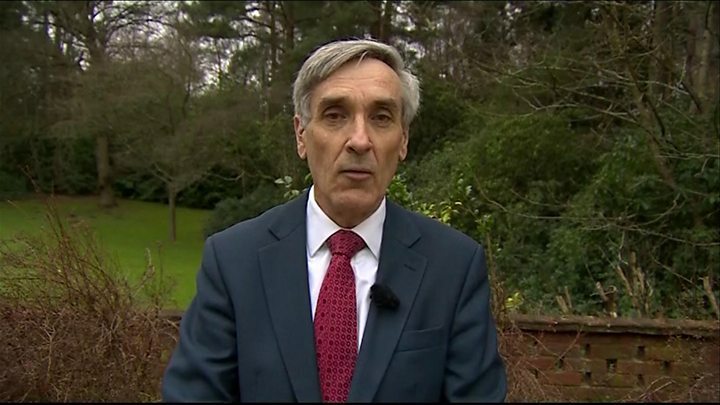 Conservative former minister John Redwood, who is part of Conservatives for Britain, a group campaigning to leave the EU, told the BBC the "emergency brake" proposal fell "well short" of the need for Britain to regain control of its borders . "It says we have to beg, in extreme circumstances, for the permission of the rest of the EU to not make payments we don't want to make - it's simply a bad joke," he said. Conservative MP Nick Herbert, who backs the PM's stance of wanting to remain in a "reformed Europe", said what "the middle ground of opinion" wanted from the negotiations were effective measures that would address "the unnatural draw" of migrants to the UK. 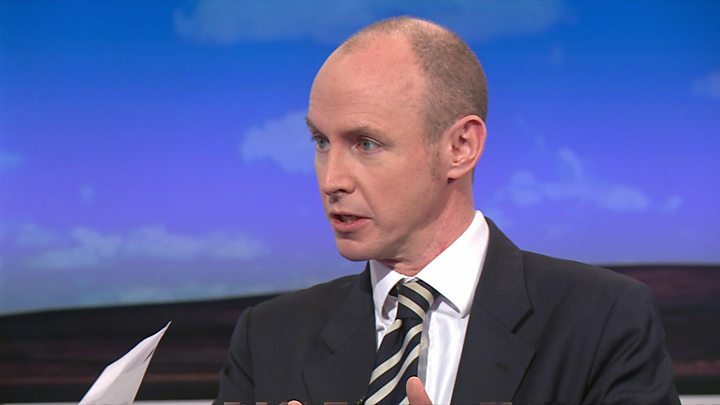 "If there is a lever that can be pulled soon enough and will operate for long enough and would be a tough and practical measure, that would address our concerns," he told BBC Radio 4's Today programme. What are in-work benefits and who claims them? The Department for Work and Pensions does not collect figures on the number of non-UK nationals claiming benefits at any given time. But according to figures from the House of Commons published in November 2014, there were at the time 252,000 working families from the European Union claiming tax credits, the main type of in-work benefit. Working tax credits are payments designed to top up the income of those in low-paid jobs and who work a minimum number of hours. The report suggested there were also 48,000 single people from EU countries claiming tax credits. Mr Cameron says he has already taken action to restrict access to out-of-work benefits for EU nationals and was confident of agreement on stopping them claiming child benefit for dependants living abroad. Downing Street sources urged caution over reports of any breakthrough, saying Friday's talks would look at the "totality" of the renegotiations, not just migration and welfare. Mr Cameron is also due to have a working dinner with European Council President Donald Tusk in Downing Street over the weekend, and will hold talks with German Chancellor Angela Merkel before an EU summit on 18 February.